Harvest is the most intense time of the year for us. We create crews of 10 people with a crew leader for each of them. We also berry sample each vineyard and forward the results to the appropriate client/winery. Delivery scheduling is based upon the results of the brix. 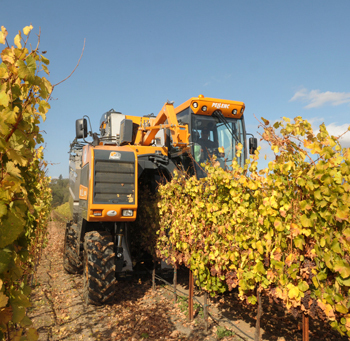 We work closely with each crew to pick and haul the grapes to the winery in a timely manner. Delivery of ‘clean’ fruit to the winery in a timely manner is our number one goal. All the gondolas in the vineyard have a leaf picker in them making sure the grapes arrive clean. Co-owner Linda Barr personally checks the gondolas for this. She also makes sure the crews pick the vines clean and don’t accidentally leave grapes on the vine or on the ground. Our tractor drivers in the field have to comply with our safety rules. Seat belts must be worn, the speed of tractor is monitored, SLOW, extreme caution when exiting the field with a full gondola to be loaded on the truck and when returning with an empty. There can be up to fifty employees in the field at one time so SAFETY is a must. All foremen must wear our safety vests and carry two-way radios. Safety binders are on site at all times. While harvest can be stressful, it is the most rewarding time of the year for us!